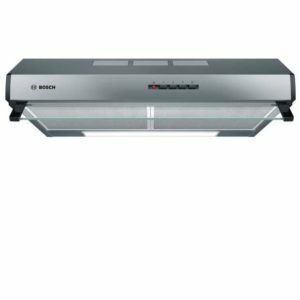 Conventional hoods are either rear or top ducted and come in a width of 60cm or 90cm. They come in a range of colours and styles to match the look of your kitchen. we’ve got some stylish black models as well as the more simple and classic white and stainless steel hoods. They simply hang on the wall above your hob or sit underneath a wall unit. These models can usually be recirculated using optional charcoal filters. With offerings from Miele, Bosch and Neff, you can be sure that you’re investing in top quality for your kitchen. 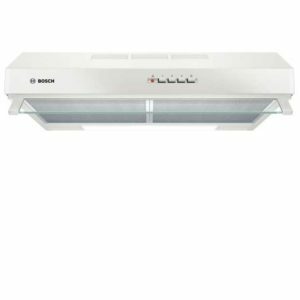 Designed to be mounted under a cabinet, the DUL63CC20B from Bosch offers fantastic extraction with simple design. Boasting an extraction rate of 350m³/hour it can easily draw away steam and cooking aromas, leaving you to cook up all your favourites without the lingering odours. This model can be installed using ducting for maximum efficienct, but can be installed with charcoal filters for recirculation. 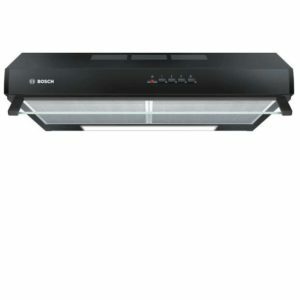 Tthe Bosch DUL63CC50B conventional cooker hood is finished in brushed steel and is designed to be mounted under cabinets. Offering three power levels and a maximum extraction rate of 350m³/hour, it will be able to make short work of all the cooking smells and steam while you can concentrate on cooking up a storm. Ready to be installed beneath a cabinet, the DUL63CC60B from Bosch makes light work of steam and odour. Boasting three speed settings with push button controls, it can extract at a rate of 350m³/hour. You can install this model using charcoal filters or ducting depending on your kitchen layout.